Welcome Back! It's time to BLOG-HOP for the reveal of the New June Releases at ODBD, and this month, we are celebrating Dad! I've cut these tools out several times and layered them for dimension. Also used silver brads for extra metal. Aren't these tool so fun? My second card was created with the same metallic cardstock, but with white embossing, sections, some blue and gray sponging/distressing and some paper piercing. These tools are so much fun to layer. The DT came up with lots of amazing ideas. 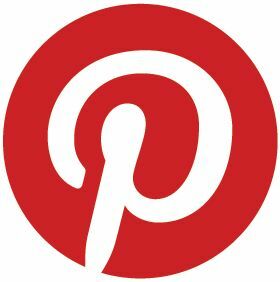 If you arrived here from Dawn's Blog, then you are in the right place! If not, please return to ODBD to start there and check hop details. To continue on the HOP, be sure to stop by these DT Member's Blogs for inspiration and your chance to WIN! Have a wonderful and blessed week. Both of these are gorgeous America. Beautiful masculine cards,love the colors too. Hi America what beautiful cards I love looking at your cards as they are always great colours and the designs are wonderful. This is so fun seeing what each of you have done with these new sets. Love the tools - great in blue and silver. America, your cards are fabulous. I especially love the first one in the blue and silver. Great job on both cards. Super guy cards with all that metal! Great cards! 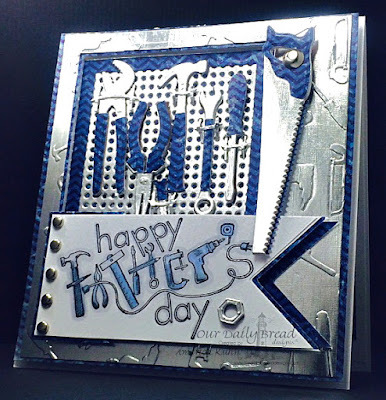 Love your use of metallic cardstock! Thanks for sharing! These are both great masculine cards. I really like the first one with the dimension and fantastic die cut tools!! Those tools are amazing...love your sample cards America! These are fantastic and so much fun. I love the way you colored the paper on the second card. Fantastic creations! Awesome Father's Day card. I definitely need those dies. Perfect masculine cards. They look so great with the metallic! Wonderful Fathers Day cards. Love the embossed metallic backgrounds. Your cards are fantastic..love the metallic look. I can also see the art work as journal or album covers. Thank you for sharing! Great male card, love the way you have layered the tools for dimension. I like your use of metallic cardstock on your cards. Wowza America!!! Love them both!!! The silver is so shiny it looks real on those tools, and I love the color combo and texture on both of them!!! Just over the top gorgeous!!! Your cards are fabulous! I just love the tool sets for masculine cards. 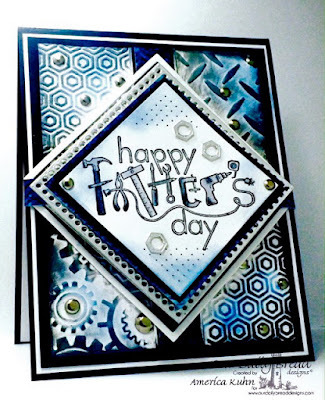 What perfect masculine cards for Father's Day! I love the use of silver and blue in this! Thanks so much for playing Simon Says Stamp Wednesday “Anything Goes” Challenge! Fabulous masculine cards. I love the silver look. These are such great cards. The color scheme really makes them feel more real. You did an awesome job! beautiful cards!! love the blue card!! It's very nice.. I always struggle with masculine cards... love the peg board and the tools dies.. that's just awesome!! Gorgeous America!!! I just love the silver metallic paired with the blue on the first!! So rich and shimmery with so much texture!! The second really has the metallic look with your added sponging of white. Gorgeous technique and design my friend!! Such a great take on these sets - especially with all the blue! Thanks for sharing. Awesome samples, America! Both remind me of a diamond plate tool box in the back of a truck! Love the look of the second with the embossing and sponging! Thanks for playing with us at C.R.A.F.T. Challenges and good luck! Awesome cards! The metallic card stock looks great with these tools! Great masculine cards. Love the metallic look with these stamps and dies. America, your "heavy metal" card making is stunning and so perfect for masculine cards! Both projects are stunning! America - WOW!! I love both your cards in these fab metal papers. The first is so striking and every detail given so much love and attention, and I love that!! The second has the same attention to detail and has completely stolen my heart. I can't take my eyes away because I keep seeing something new. Thank you too for your kind comments on my Blog. I'm definitely a fan of your creations - I think I love everything you've ever made - ever LOL!! Seriously. WOW…what awesome masculine cards you've created, America! Love the metallic elements on both cards…the embossed metal and the white embossing paired with the blue is such a striking combination! Excellent release projects, my friend! Hugs! Gosh America! Amazing! Excellent! Fantastic! Wow!! I love these! America, your cards are fabulous....the colors are so striking! Fab and funky. Thank you for joining us over at the Scribble and Scrap Challenge. Good luck. 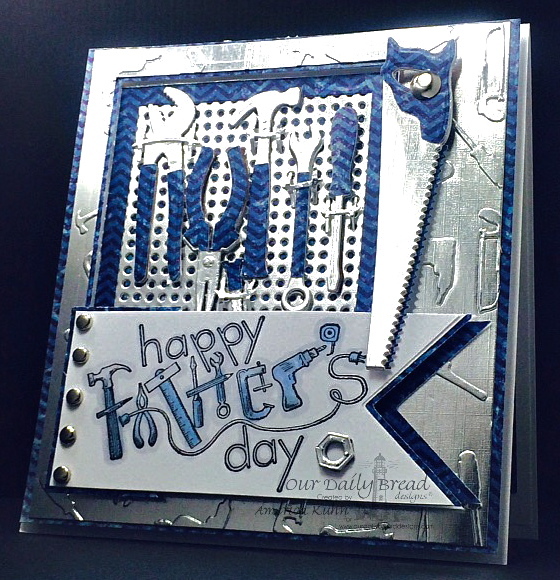 Fabulous masculine cards, love all the added dimension and texture on the tools! These are fabulous, America! I love the silver/blue combo & the different embossed bgs are just super.